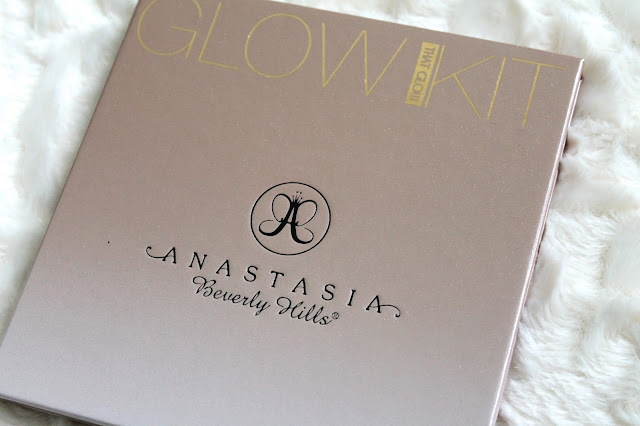 It was my birthday last week, and one thing I received from one of my friends was the Anastasia Beverly Hills Glow Kit. I was so excited when I opened this highlight palette because about two weeks prior I was so tempted to buy this while at the mall. Luckily, I decided to save my money, and good thing I did because it was such a great surprise to open! This palette comes in two different shades; Gleam and That Glow. I have That Glow, and it is so beautiful! Prior to receiving this palette I had watched so many reviews on these palettes, and from the videos I was so in love. So now that I own it myself, I have been using it almost everyday. It looks so great on my skin which is awesome because right now I am very pale. I am excited for summer to come so that I can get a tan, and see how this looks on my skin then. Now on to my pro's and con's of this palette! Honestly, I can't even think of anything negative about this palette. It is everything you would want, plus more. For the price of this palette you are getting 4 very large pans. I love BECCA highlighters, but for comparison reasons this is a much better deal. For one BECCA Shimmering Skin Perfector you get .28oz of product, and it costs $38. At only $2 more, you get pretty much 4 of the Shimmering Skin Perfectors. If you have wanted a BECCA highlight but do not want to spend the money on just one highlight powder I highly recommend picking this Anastasia palette up. Not only is it a great deal, but it amazing quality. I recommend picking it up ASAP because this palette is limited edition! I am thinking about grabbing Gleam glow kit, but I can't decide if it is too pinky toned for my skin tone. I have light medium skin but in the summer get tan (I am mixed black&white), and I am not sure how all four of the highlights would look. I could save it for the winter, but I am still debating. If you have Gleam, or both of the kits let me know in the comments what you recommend! If you love this kit as much as I do let me know in the comments as well!